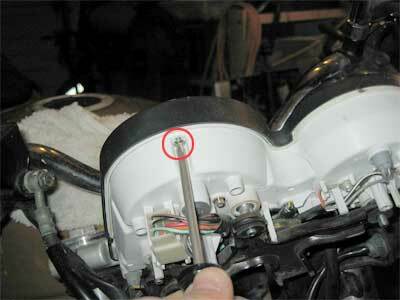 This document explains how to repair the peeling tach face on the Suzuki SV650 motorcycle. 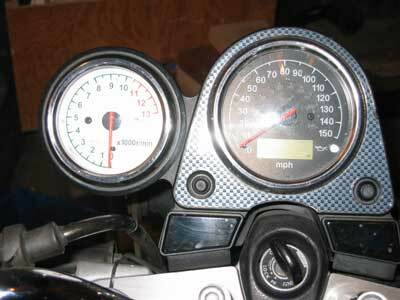 The 1999-2003 year SV650 bikes have a common problem where the sticker on the tachometer face starts to peel. These instructions assume that you are going to replace the sticker with one of my replacement stickers. The repair is fairly easy to perform. The photographs and instructions are based on a 1999 SV650 (Naked). They should still be useful for the SV650S (faired), but you'll have to remove the fairing on your own. Important: Make sure to select the Small (3x5) sticker in White. Note to SV400 owners: I made a sticker specifically for the Suzuki SV400. 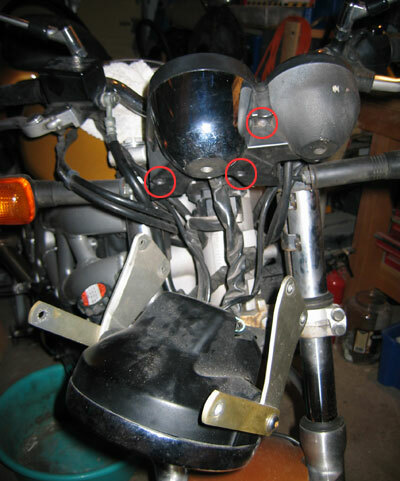 The colors and style is the same as the SV650 one, however the locations of the tach markings are a little different. The SV400 sticker is also available on CafePress. If you have any questions, suggestions or feedback, email me at . You'll need a basic workshop to perform this repair, and some tools (listed below). Philips head screwdrivers (sizes #1 and #2). A selection of small metric sockets (around 9mm - 14mm). A selection of metric allen keys. X-Acto knife, or utility knife. Scriber, safety pins and/or nails (to punch holes). Razor blades and razor blade holder. WD-40, or some other solvent to clean the old face gauge. Read these instructions and ensure you are comfortable following them. Order a replacement sticker from my CafePress store. Start your engine, allow the bike to warm up fully, and record the exact RPM at which your bike idles. 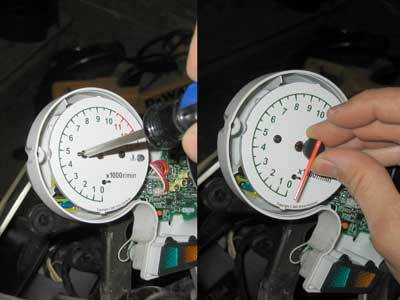 This is to verify that the tach needle does not need adjustment after you replace it. Mount your motorcycle on a stand (if available). 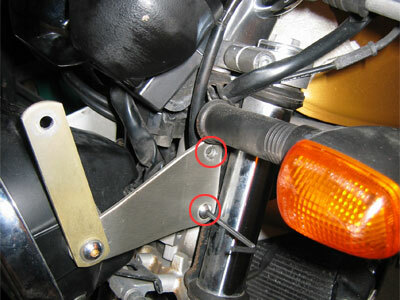 Remove the two bolts (circled) that secure the headlight adjustment assembly to the forks. 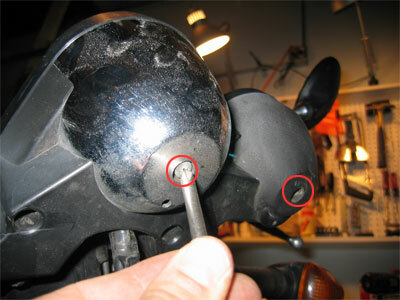 Using an allen key, remove the 4 bolts (circled) that attach the headlight brackets to the fork. The headlight can now be carefully moved forwards, to provide access to the instrument cluster. Use shop towels to cushion the headlight once removed; it will hang by its cables. Unscrew the three Philips-head screws that hold the black plastic rear cover of the instrument cluster. The lower plastic cover can now be removed. Unscrew the two larger Philips-head screws behind the center of the speedo and the tach, respectively. The two cowls can now be removed, as well as the rear plastic cover (the thing my finger is holding). 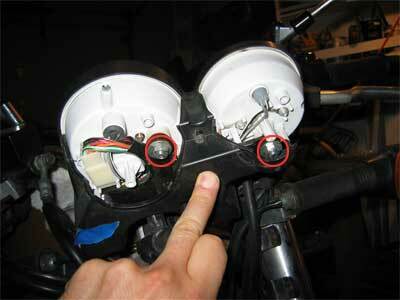 Now remove the two large bolts that attach the instrument cluster to the fork. Unscrew all the philips-head screws that attach the front instrument cluster cover to the instrument cluster. There are around 4-6 of these. All these screws are the same style. When they're all free, the front cover (with the transparent plastic gauge faces) will come off easily. 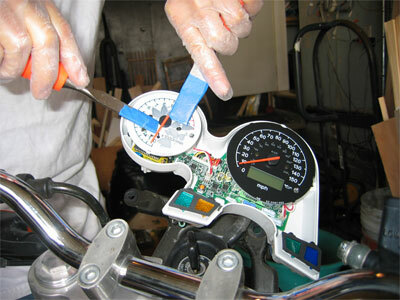 Very carefully, remove the tach needle. The tachometer needle is a push-fit onto the pin that turns it. This is easiest to do if the tach face is still attached. The best way to do remove the needle is to carefully lever it off using two blunt instruments, applying pressure evenly with both. I used two chisels covered with a couple of layers of painter's tape. Do not allow the needle to turn as you pull it off. 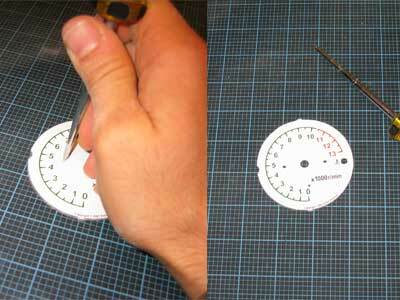 You want the needle to stay at the "0" mark as you pull it off, so when you replace it it will not need any adjustment. Remove the two small philips-head screws that attach the face to the cluster. The cluster can now be removed easily. Also remove the needle-stop, by (very carefully) squeezing the two anchors at the back of the face, and pulling the needlep-stop out. 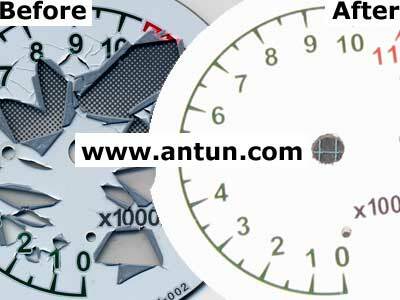 Remove all the peeling tach sticker from the plastic tach face. Ideally, use a razor blade scraper to do this. If you must use a solvent, be careful! You don't want to get any solvent on the back of the plastic face; it could damage the pattern on the back, which affects how light is passed through the face (the tach is partially back-lit). 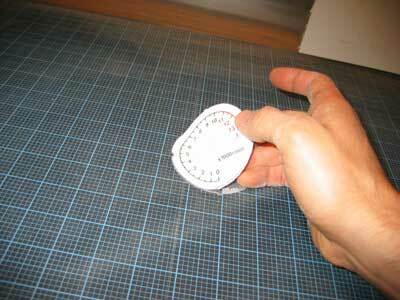 Using scissors and/or a utility knife, cut out the new sticker, along the guide line. 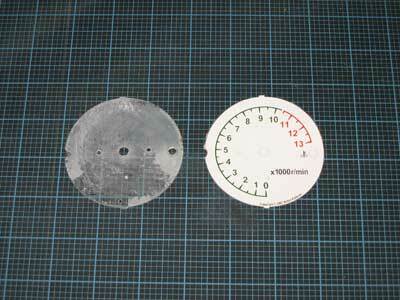 Using the tabs/indents along the circumference of the sticker as a guide, attach it to the tach face. Glue it from one corner, so that air bubbles do not appear. A common practice when gluing stickers is to spray a fine mist of warm water mixed with a little dish soap onto the surface you are adhering to. That makes it easy to position the sticker exactly where you want it. You then use a squeegee to squeeze the soap mixture from behind the sticker. Although I have not personally tried this approach with this type of sticker, it's worth considering if you're worried about getting the sticker placement right. 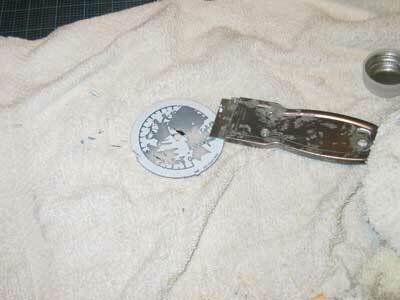 Once the sticker is attached, pre-punch the holes for the screws, needle, needle stop and oil light. The best approach I found was to punch a hole using a thin needle, then enlarge the hole with a sequence of progressively larger nails and/or drill bits. Punch holes into the face from front to back. That way, any extra sticker material will line the inside of the hole. Reinstall the needle stop, taking care not to break the delicate plastic anchor. Mount the tach face back on the instrument cluster and screw the two philips head screws in to attach it. Reinstall the needle by pushing it back onto the face plate. Be careful to keep the needle against the needle-stop as you are reinstalling it. 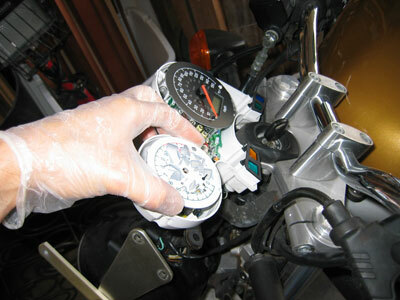 Before reinstalling the cover, start the engine and allow the bike to warm up. Verify that the idle speed is the same as it was before you began this repair. 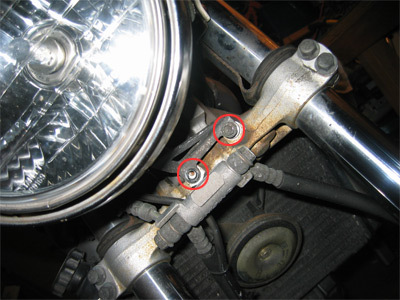 Contributed tip: When the ignition is turned on, the spindle will reset to the "0" position. Use this feature to help you reinstall the needle. The remainder of the reassembly is the reverse of disassembly.